The small city of Fontainebleau grew and developed around the remnants of the forest of the same name. For several centuries, these grounds were part of the royal hunting estate belonging to the successive French kings who ascended the French throne, starting with King Louis VII. Nowadays, it is a municipality of around 16 thousand inhabitants, situated in Île-de-France region some 70 kilometres southeast of the capital, Paris. It stretches for more than 17,000 hectares and is the largest municipality, by density of area, in the whole region. The vast tract of land on which, ultimately, the city developed, was originally kept as a royal hunting estate in which all the French kings built chapels, havens to which they could escape from the city and the famous palace which today is part of the UNESCO World Heritage Programme. The palace, which started life during the Renaissance period, (although it was comprehensively rebuilt during the reign of Louis VII), was a theatre for many generations and a political meeting place in which peace declarations and declarations of war were signed. It was also a hub for artistic experimentation and the spread of cultural enlightenment. 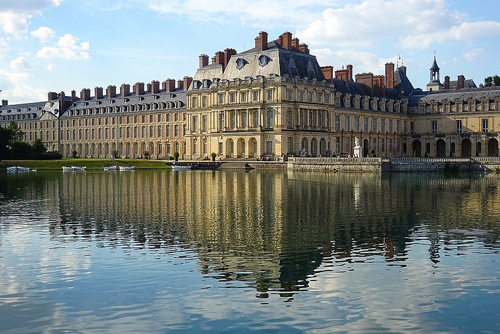 There is even a "Fontainebleau Style" which is characterised by the use of intricate inlays, baroque designs and grandiose gardens that were almost as splendid architecturally as the buildings themselves. In this impressive and imposing setting, at the invitation of the sovereigns, artists of the calibre of Francesco Primaticcio, Benvenuto Cellini and Leonardo da Vinci were amongst the famous visitors and their works are now well cared for adorning the walls of the Louvre in Paris. To summarize, having started life as the backdrop for the royal hunt, in a relatively short time, Fontainebleau metamorphosed into the setting of a splendid palace and one of the most important cultural hubs in Europe. You just have to remember that many of the social and artistic dictates of the Renaissance were born or nurtured here first and subsequently travelled to the capital. Today, it is the home of a large and particularly specialised school of learning known as "The Fontainebleau Schools" in which students can study art, music and architecture as well as being the location of the world famous INSEAD business school.And the forest that surrounds this seat of learning is also iconic for its biodiversity and because of its size - it covers some 15,000 hectares with its beautiful array of trees, large boulders and its waterfalls. Once might say, a paradise inside a paradise! The Fontainebleau Tour Service will make it possible for clients to enjoy a memorable excursion around the small city of Fontainebleau with the vehicle and driver of their choice. And if the booking is made sufficiently far in advance, you can also specify that you would like an English speaking driver. Thanks to this tour in a private car, you will be able to visit this beautiful city, the vast parks and the famous palace which today form part of a UNESCO World Heritage Site. All of this can be enjoyed in complete freedom as the passengers will be able to choose the time at which they want to be collected from their accommodation (in Paris), the itinerary they want and also the duration of each stop on the tour. Today, reaching the city of Fontainebleau via public transport from central Paris is not particularly easy. Quite often, the decision to entrust onself to the metro or the bus service, for someone who doesn't know the French capital and its modes of transport well, can result in ending up further away rather than closer to one's intended destination. Because of this, there is the risk of wasting precious time for those visitors who want to make the very best of their time visiting the venues they have chosen as being of special interest. And let's not forget that, once you have arrived, finding your bearings in an area that stretches for 16,000 hectares is not exactly easy - so, there is the additional risk that you won't get to see everything you want to. Now you can choose to avoid all this inconvenience with the click of a button! All you have to do is choose the "Tour Fontainebleau by Car" service. The booking form is also very simple and can easily be adapted to accommodate whatever kind of visit you want to organise. You can choose the vehicle size (depending on the number of passengers) and the driver who will accompany you on your private tour (either an English or a French speaker). The driver will collect the client(s) from where they are staying and will show them the most beautiful sights in Fontainebleau which you might not get to see if you are not accompanied by someone who knows the area well. What more could you ask for? Simply make the choice to book "Tour Fontainebleau by Car!"